Just received my ZUBAX GNSS 2 module recently. 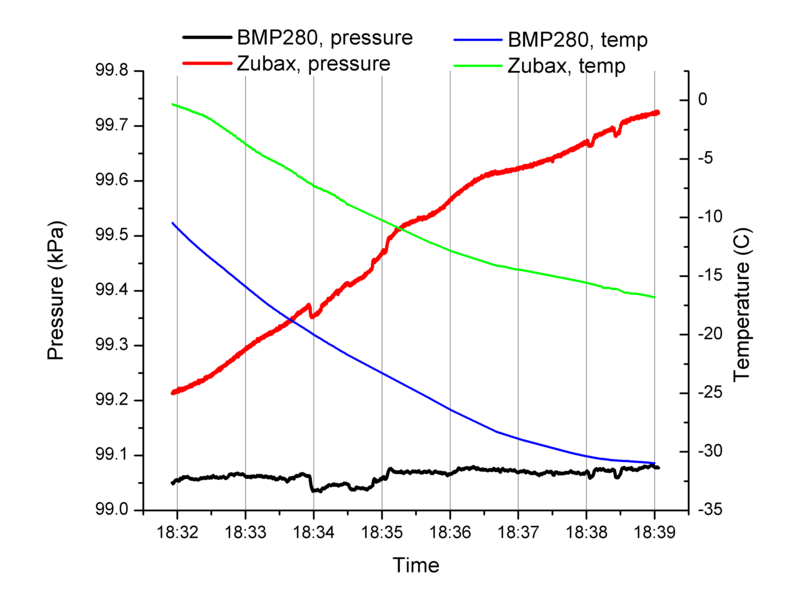 Here is the results of a quick test of pressure and temperature readings from Zubax vs BMP280 sensor (https://www.adafruit.com/product/2651). Two modules were set up side by side in a room and run simultaneously for several hours. Data is collected at one second intervals using Raspbery Pi 2 and a code written in python. Zubax module is connected via USB. BMP280 module is connected via SPI. board, the measured air temperature may be offset by up to +5 kelvin. 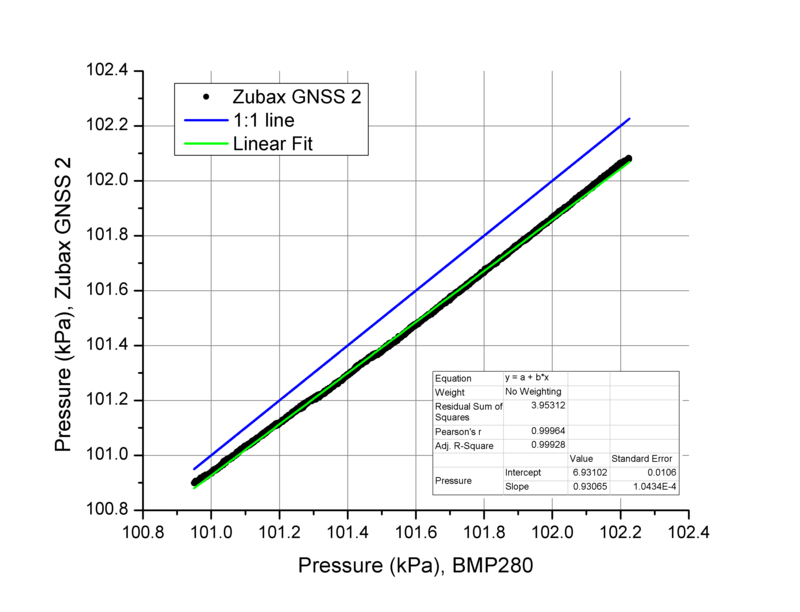 We use TE Connectivity MS5611 in Zubax GNSS, which is reportedly more precise than BMP280. This information is just FYI. Temperature offset is understandable. It was noticed that ZUBAX board is warmer than BMP280 module. No issues with this. Temperature oscillations on the plot seems to be due to natural air temperature variation in the room. But it is clear that BMP280 module has finer resolution in comparison with Zubax one. Regarding the pressure, I also have read that MS5611 has superior specs than BMP280. 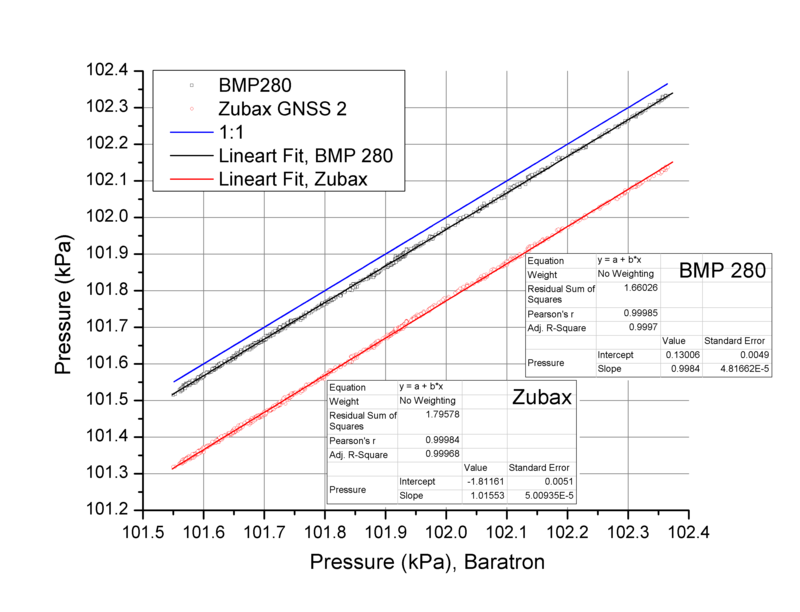 If I have time I will run both Zubax and BMP280 modules together with MKS Baratron pressure gauge I have in the lab to see the difference. MKS Baratron suppose to be very precise and stable. 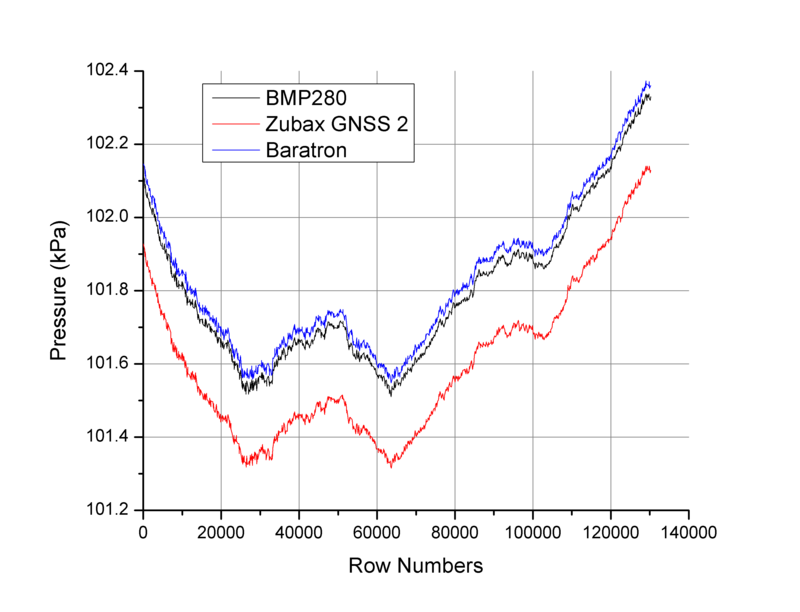 An update for BMP280 and Zubax GNSS 2 vs MKS e-Baratron is below. MKS e-Baratron model number is 627C13TGAC1B1. Absolute accuracy: is 0.1% of reading. The measurement conditions are as described in previous posts. Hi…I get similar drift results with temperature. This is indeed weird, as the pressure compensations using the stored calibration and correction values should take care of this. It apparently doesn’t. As to the noise, this is pretty normal. Also the measurement frequency plays a big role in pressure drift. For instance, when I measure at 5 Hz or 1 Hz creates huge offsets in pressure readings. I contacted the manufacturer but did not get a satisfactory answer to any of these issues. If you have found a cure I would be very much interested. Hi there, I did not find any solution other than using pressure data from my BMP280 instead. Zubax GNSS 2 gives me GPS data with very nice precision. But pressure and temperature do not satisfy my requirements. 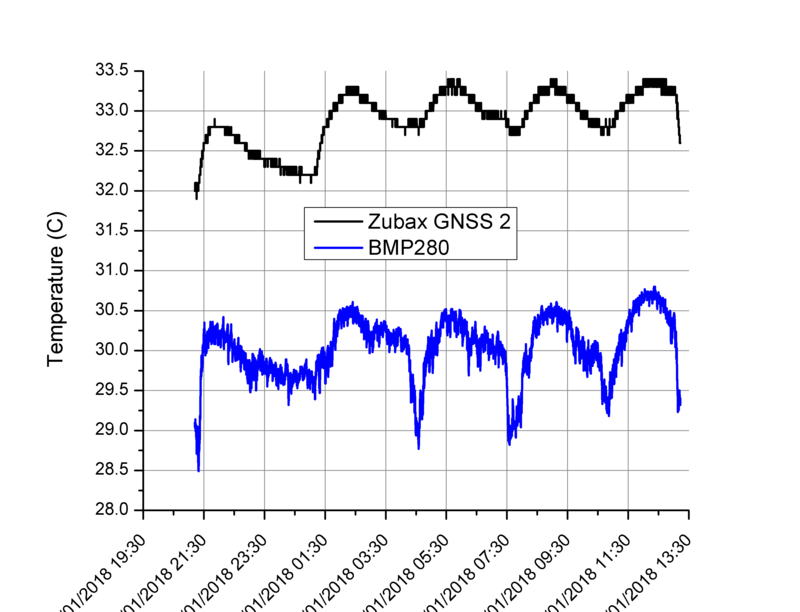 Below is another result which shows significant drift in the pressure readings from Zubax GNSS 2 while it was moved from a car (~0C) to outside (-30C). BMP280 was attached to Zubax unit and did not have such drift. Small fluctuations in the pressure readings from both units are associated with natural pressure variations as well as slight changes of the altitude during the move. Zubax manufacturer claimed they implement temperature compensation. But the results show there is obviously something wrong with it. The datasheet says “The device employs the TE Connectivity MS5611 digital barometric altimeter”. I do have a separate MS5611 sensor. 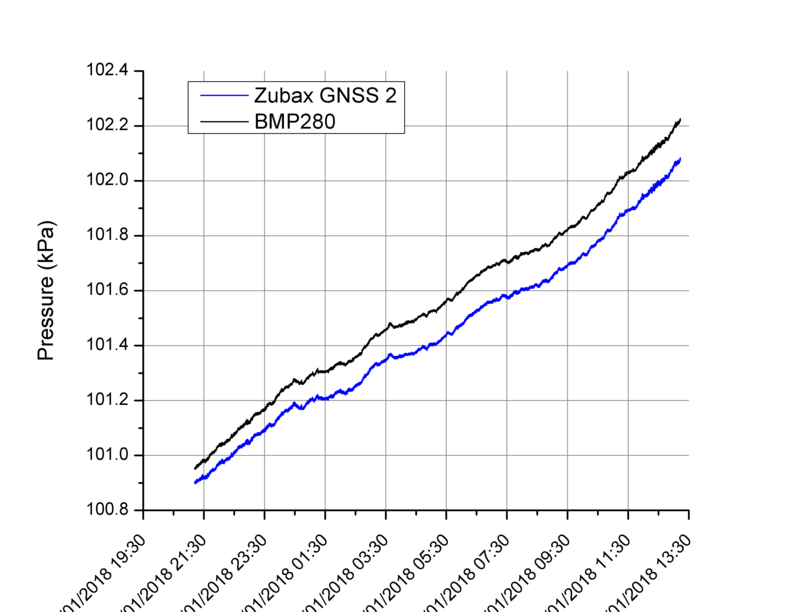 I probably have to carry out similar temperature test using all three units: Zubax, BMP280 and MS5611.